Former NFL All-Pro Tra Thomas is helping South Jersey get fit. During his 13-year NFL career, Tra Thomas spent 11 seasons manning the offensive line for the Philadelphia Eagles, a team the Florida native felt destined to play for. “I took all the recruiting trips: Dallas, Oakland, New Orleans, Washington. … After I visited [the Eagles], I was set to go to Seattle and I canceled the trip because I knew this was the city I wanted to play for. I’m glad it worked out,” he laughs. Since his playing days and now during his retirement, the 6’7” Thomas has been hard to miss in his adopted hometown of Medford. Last April, with some encouragement from his wife, he opened up 7 Deuce Sports, a 7,000-square-foot fitness facility in town at the site of a former Blockbuster. It’s an intense space filled with a sand pit, a turf field and a G.I. Jane-inspired bell you can ring when you’ve had enough. We caught up with Thomas in between workouts to talk about the business, life in South Jersey, and his latest venture as a TV analyst for Comcast SportsNet. 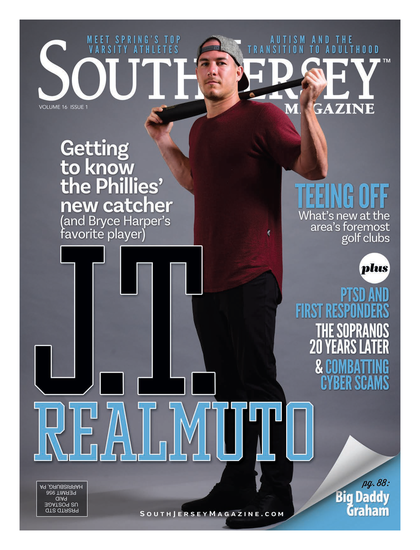 SOUTH JERSEY MAGAZINE: What was the inspiration behind the new facility? TRA THOMAS: Originally all I wanted to do was a school where I could rent some space from another gym and just go in and teach offensive line technique. I went to a couple other facilities and they turned me down, so my wife really pushed me to open up my own space. Living right around the corner, we saw this space was available and jumped on it. SJM: Were you really into the fitness aspect during your playing days? TT: (Laughs) You know, I’ve never been a fitness guru, I like to eat like the next man. [But] I’ve always enjoyed working out. SJM: A lot of former athletes have stayed in the area, but you opened a business here and put your name on it. Why? TT: I’ve done several businesses that flopped where I just depended on someone else to do it, so coming in and doing something like this and I’m putting my name on it and my reputation on the line, I wanted to be in here and live and breathe it. Being around the kids who come in and train, they want to come in and see me here. I’m here every day. SJM: Tell me about the bell. TT: The bell is inscribed “Defeat is a Choice.” There are only two ways to make it out of the workout, you either finish or you ring the bell and you get kicked out. It’s really there to have you make a decision. You must notify everyone on your way out. SJM: How have you enjoyed doing the TV work? TT: The TV role was really a big change for me because I never was a media guy when I played. I never was trying to get in front of the microphone to see myself on TV. For me to do the broadcasting part was totally different. It’s fun, it keeps me into it … I don’t ever want to get into doing the interview part of it, but I like sitting around and talking about the finer parts of the game. SJM: And I know you worked with Ron Jaworski over at NFL Films to polish your skills. TT: I used to go over there and watch film with Jaws. I thought for me to get into this, I really wanted to know what the heavy hitters were doing. [ESPN’s] Sal Paolantonio kind of took me under his wing and talked with me on a lot of different things I needed to work on. [Comcast SportsNet’s] Derrick Gunn really coaches me up on what to say, how to present it. SJM: What are you enjoying about life after football? TT: My body not hurting like it used to! I’m enjoying my family more, to be with my kids. You really don’t have enough time during the season. I go to their basketball games, go to their karate; doing stuff like that is big for me. We went sledding for the first time last year. SJM: What do you miss most about playing days? TT: Right before the game starts, being out on the field, getting everyone riled up. That pregame ritual, knocking each other around and stuff, I really miss that. The other stuff really hurts (laughs). Published (and copyrighted) in South Jersey Magazine, Volume 8, Issue 10 (January, 2012).